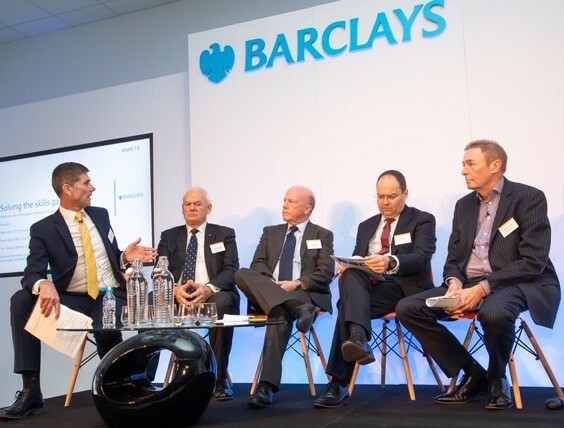 Business bosses attending Barclays’ National Manufacturing Conference have proposed a range of solutions they feel are needed to help bridge the UK’s skills gap. Influencing children at a younger age in primary school and a higher quality of work experience were just two of the ideas discussed in a debate chaired by Ray O’Donoghue, Barclays’ head of Midlands corporate banking. Other proposals included giving teachers more industry knowledge, improving the image of modern industry, and combining academic and vocational education to produce better-prepared workers for the engineering and manufacturing sectors. More than 100 people who attended the conference at the Marches Centre of Manufacturing & Technology in Bridgnorth were told how a recent Barclays’ report into skills revealed just 6% of 16 to 23-year-olds were contemplating a future in industry. Alan Lusty, chief executive of adi Group, an engineering firm based in the West Midlands, said his company was pioneering a pre-apprenticeship programme for 14-year-olds that saw children spending half a day a week in his factories for two years. He said: “By 2021, adi Group alone will need to almost double its workforce which means finding up to 500 skilled apprentices, workers and potential engineers in the next three years. Mr Lusty added that the best time to catch a child’s imagination is at the age of four or five and that the eventual aim of adi Group was to work with primary schools to influence younger children. Frank Myers MBE, an engineer and business boss who is now chair of Herefordshire Business Board, agreed that the real need was to get to children “way before” they reached 14 because at that age many had “already decided” on career paths. He said that the EEF was trying to improve the outdated image of industry by using young apprentices and graduates at its events to explain why they are interested in manufacturing and engineering. But he added: “We need to listen to our young people more about why industry is unattractive and changing those perceptions will take years. Professor Phil Webb, head of the Centre for Structures, Assembly and Intelligent Automation at Cranfield University, said the “industrial carnage of the 1970s and 80s” had produced a generation of parents “scarred by that bad image” which didn’t help children’s career choices. He said that the “demise in vocational education” for the industrial sector caused by the loss of polytechnics also meant there was a divide between industry and academia, and that reintegration was needed. Several comments from the audience criticised how industrial work experience for school children had been damaged because of the modern day needs of insurance and health and safety risk assessments. Mr O’Donoghue thanked the panel and said their ideas – and those suggested by the audience – could be brought together to help bridge the skills gap. “The skills gap is an issue we all need to address, whether you are a young person, an employer, a school, college, university or even a member of the Government. We need to get the disengaged engaged and this starts with changing industry’s image. “When young people, teachers and businesses visit MCMT there’s a wow factor, with over £4m spent on the latest CNC machines, metrology, robotics and automation. It’s this we need to harness. Who's in the running for 2018 Company of the Year title?